When Wes Pentz released his debut album, "Florida," on Big Dada in the autumn of 2004, he was a relatively obscure DJ and producer from Philadelphia. Through the success of his club night, Hollertronix, production, tireless unearthing of new dance trends from around the world (in particular, Brazil), the inception of his own label Mad Decent and his never less than brilliant DJ sets, Diplo is now a force in music culture across the planet. As a result, he's become a go-to name for production and remix work for some of the most exciting acts around. 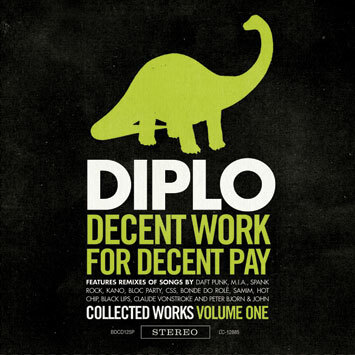 "Decent Work For Decent Pay" provides an overview of what Diplo has been up to for the last four years, starting with classic tracks and out-takes from "Florida," taking in production work on such huge records as M.I.A's "Paper Planes," Kano's "Reload It" and Bonde Do Role's first album for Domino, plus a host of remixes for the likes of CSS, Spank Rock, Bloc Party, Hot Chip, Black Lips and Peter, Bjorn & John. Also included on the finished version will be a data file of mp3s including the individual tunes recorded for the "Diplo Rhythm," the Johnny Blaze remix of "Way More", the video for "Percao" and Diplo’s remix oif Spoon’s "Don’t You Evah". In theory achingly hip, Diplo's greatest achievement is in fact an uncomplicated love of rhythm and movement - unpretentious, hyper-charged and, at root, fun. "Decent Work For Decent Pay" gets your party started. Right? Please note: Promos include a remix of Daft Punk’s "Harder Better Faster Stronger" that, due to clearance difficulties, will not be included on the finished album. Did itunes mess this up? I want to get those other tracks, this music is great.